•Specialized for T-Shirt bags, with heat cutting for non-tension sealing. •CT Series is equipped with one feeding device & one photocell, CTT Series has two feeding devices and two photocells for printing bags. 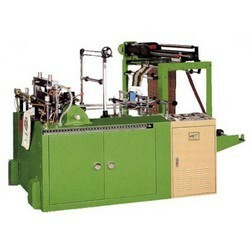 •Machine is automatically stopped if bag is jam or miss the printing mark. •Punch press & servo motor are options. Bag width 18" 26" 30" 12" + 12" 14" + 14"
Bag length 30" 30" 30" 0.01~0.15 30"